Born from extensive international research, Global Tribe documents a little understood global dance culture that has mushroomed all over the world since its beginnings in diverse psychedelic music scenes flourishing in Goa, India, in the 1970s and 1980s. From small parties to major international events such as Portugal’s Boom Festival, the paramount expression of this movement has been the festival. Via first-hand accounts of the scenes, festivals and music of psychedelic trance (psytrance) in Australia, Israel, Italy, the UK, the US, Germany, Turkey and other places, the author explores this transnational movement with attention to its diverse aesthetic roots, national translations and internal controversies. As a thoroughly engaging multi-sited ethnography and an intimate examination of the digital, chemical, cyber and media assemblage of psytrance, Global Tribe studies the integrated role of technology and spirituality in the formation of this visionary arts movement. 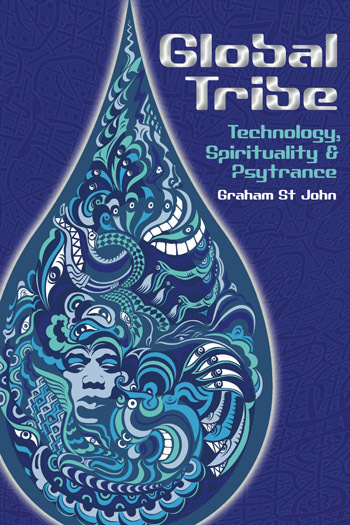 The book demonstrates how the event-culture of psytrance accommodates rites of risk and consciousness, a complex circumstance demanding revision of existing approaches to ritual, music and culture. With intensity, passion and an exquisite attention to detail, St John describes how “Goa”, as a signifier for a mythic space and time of privileged freedom for Western drop-outs, became synonymous with electronic trance music, “Orientalist” psychedelic aesthetics and shamanic approaches to DJ mixology and participant dance rituals. . . . Reporting in from over a decade of travels to psycultures events around the globe, St John theorizes the ontology of the traveller, describing how the Western drop-out explores “being-in-transit” by pursuing, and re-creating, the entheonautic exploration of altered states first pioneered on Anjuna beach. The many insightful and often provocative passages of Global Tribe are born out of St John’s dedication to being-in-transit as a means of self-transformation and ethnographic exploration. . . . St John calls his ethnographical approach that of the “socionaut”, whereby participant interviews but also immersion in the field with the musical and social fabric of psychonautical experiencing is interwoven with media studies approaches to electronic music and art. In short: without judgement or moralism, entheogens are ingested, described and reiterated as integral to the force and form of psyculture belongings and experiences. The resulting textual blend is intoxicating. In handling these complex issues around EDMCs, St John offers a provocative, detailed and insightful reading of psyculture that—like the best texts written from the most challenging conditions of the field—poses more questions than it answers.